Kelly Macnamara, a female kicker from Pennsylvania has been seen on Bleacher Report, ESPN, SBNation, NBC, ABC, FOX, local newspapers & all across Twitter. With over 2,000 retweets in 2 days, Kelly will now be on live, national television on ESPN Sportscenter at 8:20am EST tomorrow morning! We at Kicking World are very excited for Kelly and all the publicity she’s garnered over the last couple days. Her hit is just one example of her power. Kelly had the strongest legs of any camper we’ve seen in some time and she is a 4-sport athlete at North Penn. Not only is she their first female kicker in the history of the HS football program, but she is darn good too! “We typically get around 4 or 5 female campers a year. She’s extremely athletic and has power like we’ve never seen before in a female kicker. During one of our private lessons she hit a 55 yard field goal and multiple 63 yard kickoffs” said Coach Brent Grablachoff. At our 9th annual Jersey Shore kicking camp this past summer in Toms River, NJ Kelly was one of the field goal competition finalists making consecutive kicks back to 50 yards and even hit several kickoffs for touchbacks. 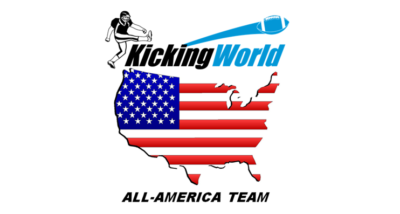 Kelly is one of 94 of over 1,100 campers this season to earn an exclusive invitation to the 2016 Kicking World Showcase in San Diego, CA. We look forward to seeing her compete with ‘the boys’ in December as she’ll be 1 of roughly 60 campers represented from over 30 states. Be sure to check out Kelly’s Hudl Page for in-game season highlights! Kelly Macnamara earns Showcase invitation at July 9-10, 2016 Toms River, NJ camp!